I’m a sucker for nostalgia and this console generation has it in spades, but among the recent slew of 8- and 16-bit inspired titles, the muddy green graphics of Nintendo’s Game Boy from 1989 have been left in the dust. 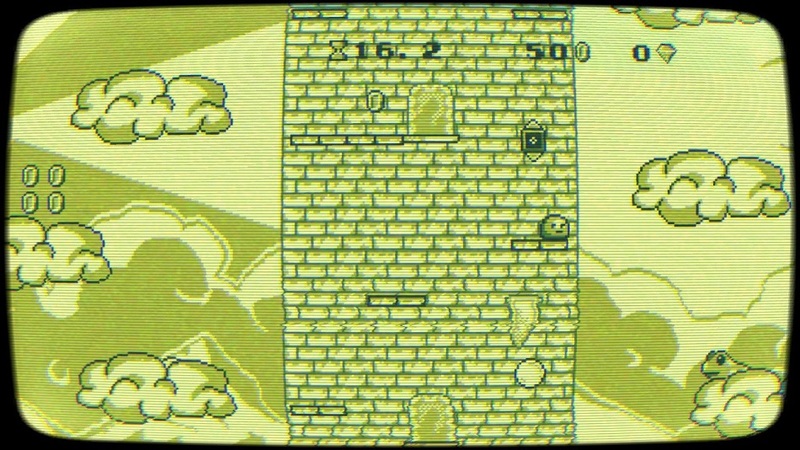 Last year saw Minit, a well-received indie that drew inspiration from Link’s Awakening (albeit in black and white rather than the aforementioned unique green hue), and now from developer /dev/pigeon comes Awesome Pea. With no hint of a story, the main draw is certainly the graphics, which seem to be vaguely Kirby-flavored while Peastays true to the Game Boy’s limitation of four shades of pixels. The game also includes two graphic modes that are turned on by default — the “CRT” filter gives a snowy, fuzzy effect which I turned off immediately as it made some environmental hazards easy to miss. It’s also hard on the eyes. The “Tube” filter is more manageable for playability, giving the display fake scanlines and rounded edges, but I found I enjoyed things most with both turned off. They seemed an odd choice as the graphical inspiration wasn’t originally meant to be played on a CRT, but perhaps the dev grew up on a Super Game Boy? 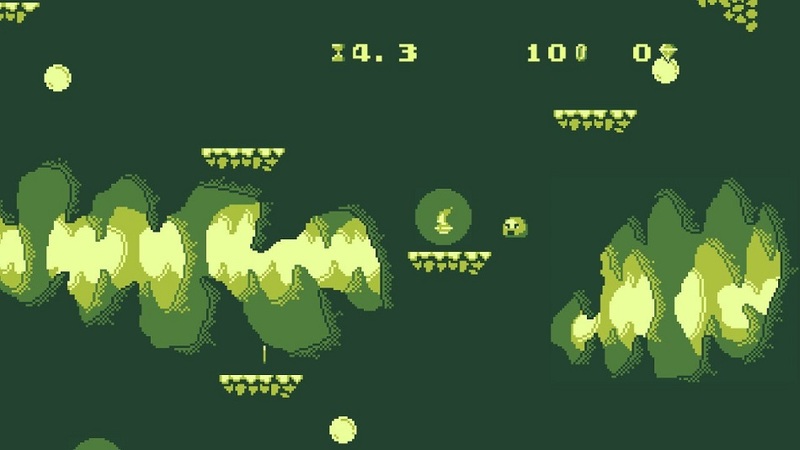 Consistent with the retro theme, gameplay is simple – the player is literally a pea, and the only controls are left and right movement with jumping assigned to the A button (there is a double jump available with a second press in mid air). There are no power-ups or items, so players hoping to wield an AK-47 as a pea may have to wait for a sequel. Mechanically, Pea is relatively sound — I had no graphic or gameplay glitches, but I did find the jumping to be somewhat unintuitive. It seems like there’s a small delay between the initial button press and the subsequent jump. Although it didn’t take long to adapt to this, I couldn’t shake the feeling that control would be much tighter without it. Movement on the ground and in the air is good, though. Thankfully there’s none of the knockback or hitbox issues that plague many indie platformers. 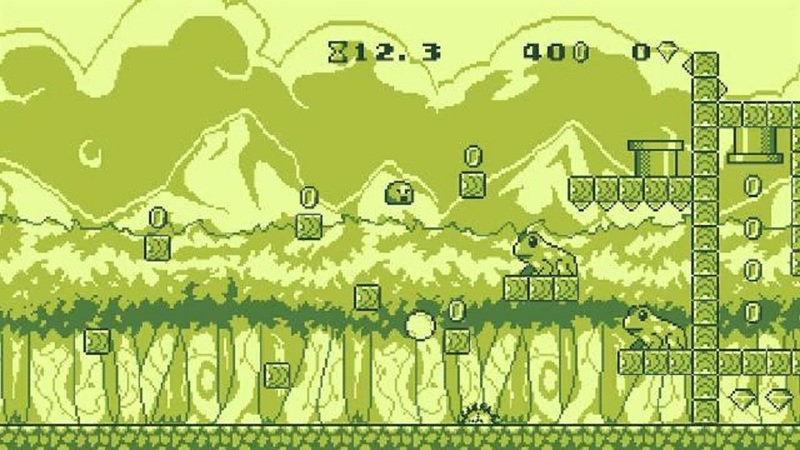 Another nod to Pea‘s Game Boy roots include a sharp overworld level select screen which reminded me of a pared-down version of 1992’s Super Mario Land 2‘s, but unfortunately once past the retro aesthetics, the charm lessens significantly. The goal of Awesome Pea is to simply traverse a short (and often difficult) 30-90 second platforming level, optionally collecting a number of coins and a handful of diamonds along the way. The level design is satisfactory, but never exceptional – I found many more interesting scenarios in user-created Mario Makerlevels – but the main problem lies with the coin and gem collection. For the first few levels I was consistently collecting all pickups, but I soon lost motivation to continue doing so. Pea regularly leaves the hardest sections of each level until the end, and the character is killed in a single hit. After running through any given level a few times, I became more focused on getting past the section I died on, rather than wasting time snagging these items over and over with a high chance of a repeated death looming. These collectables do nothing but increase numeric score for each level, so the incentive to collect is relatively low – I don’t feel like my Awesome Pea high scores are doing much for my street cred. It’s also worth saying that while the levels are short, players will still be spending up to a minute running mindlessly back to the last point of death rather than rhythmically refining their skills each time. Yet even with the wasted time, there’s not actually a lot of game here — I wrapped Awesome Pea in about two hours, and had no incentive to go back and collect items since as far as I can tell, the only benefit to grabbing the cash is a higher score. Luckily enough, for some reason the difficulty seems to sharply drop off in the last quarter of the game, because I was ready to be done by the end of it. I was enjoying what each new area would bring at first (the train stage stands out) but it doesn’t take long for Pea to run out of ideas. Levels scroll either horizontally or vertically, and the designs quickly recycle both the graphics and music. Enemy variation is next to nothing, and those with a fear of frogs spitting bubbles, tiny spikes or spinning saw blades should stay away since they’re present for the entire campaign. Frankly, this is Pea’s greatest fault — there’s nothing inherently special about the platforming, so if it plans to lean heavily on visual nostalgia, it needs to do it well. 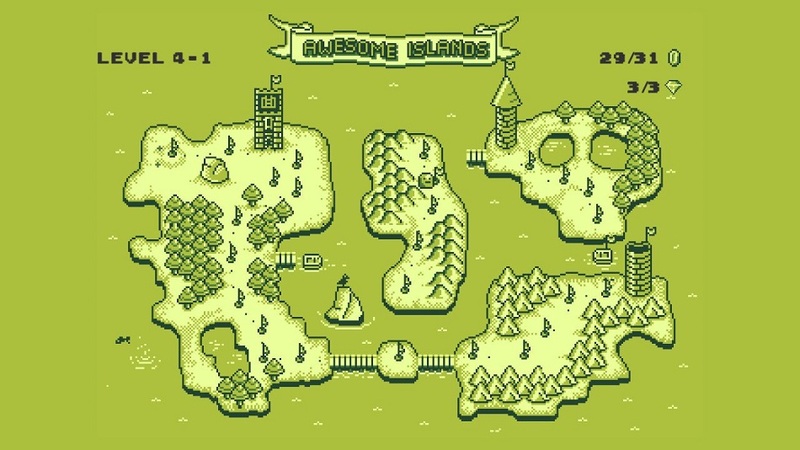 Awesome Pea isn’t a bad game, but it’s probably best suited for players who want to re-embrace childhood after their Mom sold their Game Boy for $5 at a yard sale back in ’97. For everyone else, I’d suggest a pass on this one. Disclosures: This game is developed and published by /dev/pidgeon. It is currently available on PC, Xbox One, Vita, PS4 and Switch. This copy of the game was purchased by the reviewer and reviewed on Switch. Approximately 2 hours of play were devoted to the game, and the game was completed. Parents: According to the ESRB, this game is rated E and contains Mild Fantasy Violence. It’s about a jumping pea. Nothing to worry about here. Colorblind Modes: There are no colorblind modes available in the options. It is worth noting that with the monochromatic graphics, visibility may be an issue for some. Deaf & Hard of Hearing Gamers: This game can be fully enjoyed with no sound. There are no audio cues needed for play and no speech. The text cannot be resized. Remappable Controls: There are no remappable controls available for this game. There is no control diagram. The D-Pad controls the pea with the D-pad, and A jumps. Fantastic write-up! Very true, Awesome Pea could easily be mistaken as a Game Boy game. This made me think of Mega Man xtreme 1&2 and Mega Man V on the Game Boy. Still absolutely phenomenal classic platformers. It really was a landmark experience when they came out. I remember being in awe of how Capcom shook up the Mega Man formula.